Civil Administration, Border Police find parts for dozens of weapons, including military assault rifles in truck heading for Arab village. 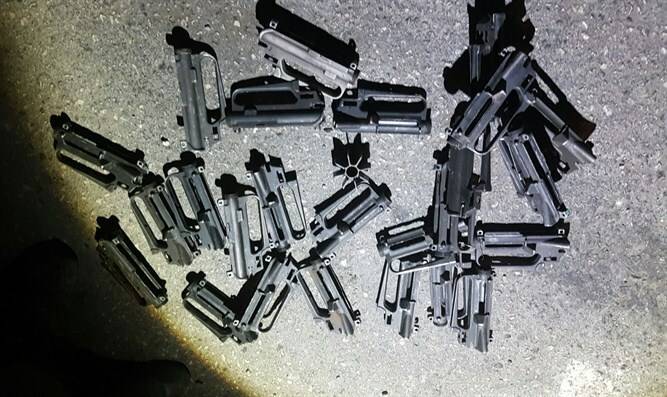 Inspectors from the Civil Administration Environmental Protection Unit and the Border Police seized a truck used in an attempt to smuggle dozens of weapons to the Arab village of Idna near Hevron Tuesday evening. Inspectors were stunned to discover pieces of dozens of M-16 assault rifles during a routine inspection of the vehicle. The truck driver revealed upon questioning that he was taking the weapons to Idna. The search for all weapons in the truck was halted at nightfall and the vehicle was confiscated and placed into storage. "The David unit operates every day at the crossings and prevents the smuggling of waste from Israel into the Judea and Samaria region," said Benny Elbaz, the environmental affairs officer in the Civil Administration. "The truck will be taken for x-ray screening tomorrow to find out just how many pieces are inside it." The police estimate that the truck contained dozens of weapons and weapons parts. The checkpoint commander from Jenin stated that they often encounter people smuggling individual weapons, and the sheer number of weapons in the truck surprised them. The driver and the passenger, one of whom is a resident of Jerusalem and the other a resident of Judea and Samaria, were arrested and taken for further questioning by the Border Police.